Hey Personal Financial Freaks! This is my second Dividend Income Summary for 2016. As you can see on my Passive Income page, 6 companies chipped in for this month. In February, I managed to collect 256.52$. The amounts are all in Canadian dollars. • Royal Bank of Canada (RY) : 102.70$ (It's RY, need I say more?). • Power Financial (PWF) : 37.25$ (Slowly but steady). • Verizon (VZ): 19.71$. (I want more Verizon!). Today I bought some more shares of Canadian Pacific Railway (CP). I now own 50 shares of CP. With an annual dividend of 1.40$ it gives me 70$ in dividend per year. Needless to say, this stock is lagging a little bit in terms of its dividend, which hasn't been increased since 2012 and is now yielding under 1%. That's very low and unusual for a Dividend Investor like me. It's also a reason why a lot of investors (especially in the bloggers community) have shy away from this particular stock. But they shouldn't! There are many reasons why this stock weights more than 5% in my portfolio. I originally bought the stock in 2011 around 56$... I bought 100 shares back then. It just gives you an idea how much the share price has rocketed over the last few years. At the time, the dividend yield was pretty much the same as its competitor Canadian National Railway (CNR). It's not the same anymore obviously. CNR has been increasing its dividend, while CP hasn't and its share has gone up the ceiling. Right now, CP is still focusing on its merger with Norfolk. One has to presume it is keeping its cashflow for this purpose (although they have had a strong shares buyback policy as of late). I'm confident in the capabilities of its CEO to create wealth for the CP shareholders in the future. He has done so with CNR and is currently putting CP in a good spot to replicate his past success. Are you an investor-fan of trains? If so, do you hold CP or CNR? Like most of you guys (or maybe not), I intend to live off at some point from the dividend I make from my investments. It may not represent all of my future revenue but I would like it to be a good chunk. I have no idea how much yet. But since you like datas so much I will give you this percentage: 40 %. That seems about right (yes it does!). What I do know for sure is where that amount, currently less than 5 K$ (you can check it out here), is mostly coming from. I hold 22 individual stocks at the moment. All of them pay dividends. But the amounts they pay vary a lot from one company to the other. Not everything is equal when you compare Barrick Gold to Johnson and Johnson or Couche-Tard to Royal Bank of Canada. The number of holdings and the variety of sectors contribute to my portfolio being well diversified. Is it true in reality ? Or are we talking about diworsifiction as Peter Lynch would put it? Knowledgeable people have said that you can attain diversification with less than 10 stocks. I believe it to be true. Take for instance one of my favorite stock, Power Corporation. When you buy POW you buy shares in an already diversified company : you are de facto invested in insurance, financials, energy (through Pargersa which holds Total), booze! (through Pargersa which holds Pernod Ricard) and so on. Same goes for other very well diversified companies like Johnson and Johnson, Couche-Tard or ATCO, to name a few. If it's important to be diversified regarding your stocks and the sectors they are operating in, it's also very important to find out where your hard earned dividend money is coming from. Because if a stock you own contribute to more than, say, 50% of your dividend income and it goes kaput, it won't matter how many stocks you own because your revenue will still be cut in half. For now, it's fine you can easily cope with it as you build yup portfolio. But what about when you are past your prime and are on a travel spree across the World? I guess it's all common sense to think about diversifying your revenue, but in the heat of building your portfolio (finding cheap and great stocks) it might be something that goes unnoticed. Some say you should hold a stock that weights more than 5% of your portfolio. I find that rule a little rigid. On the other hand, I would be very wary of owning a stock that contributes to more than 15% of my dividend (unless its JNJ!). You will agree that, although 50% is quite high for only 6 of my 22 holdings, it still remain a big number. It these 6 companies have a fallout I might get a real cut down on my paycheque. So I will have to keep a close watch on this. Needless to say, the Financial sector has the upper hand. And you don't need to be a rocket scientist to conclude that I will need to add a few more shares from the Telecom sector and Consumer Staple sector. My Energy and Financial sectors respectively contribute to already 30 and 15% of all my dividend. What does it tell me about my holdings? 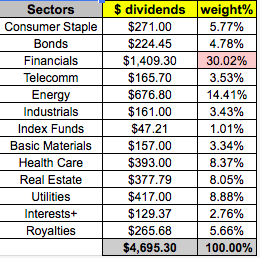 Well, it tells me for instance, that a sector like Industrial tend to pay less dividend than the Financial Sector. Should I then hold more shares of Canadian Pacific and Canadian National Railways to make it up? Not sure. I guess it's normal to have a bigger portion of my dividend coming from the big banks. It's the way it goes. But, like I said, I should definitely try to lower that percentage by increasing my dividends coming in from other sectors. I will therefore keep a close watch on $BCE (Telecom) and try to boost the dividends coming from the Consumer Staple sector. 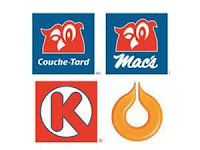 I don't know if it's a trend, but I find Mondelez, Kraft and Couche-Tard to be quite conservative on their dividend policy. Maybe I should add another player. Anyone in mind? (aside from all the big US names such as Coke and Pepsi, which are great, but too expensive at the moment). What do you think about the diversification of my dividend income stream? Any idea or tips for me? February has been quite poor Market wise and it generaly means it's been good buy wise. I can't say that I have been doing big buys but I kept the nibbling machine on. Not full blast, but nevertheless on. I have expressed many times on this blog my love for trains. I own both Canadian Pacific (CP) and Canadian National Railways (CNR). These companies have both been affected by the Market dips recently. It was a great time to get my hands on usually expensive shares of CNR. I already own CP and I won't add new shares until they start growing their dividend a little bit. It seems like they need their money right now to buy Norfolk. Will see how this goes. It's like a snake trying to eat an elephant... For now, I concentrated my time and energy on buying some more of CNR, its main competitor in Canada. 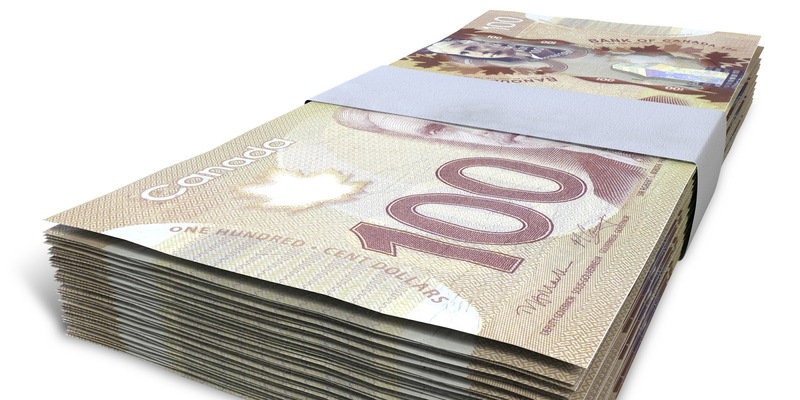 On January 26, Canadian National Railway raised its quaterly dividend to 0.375$. It represented a 20% increase. The dividend yield is still low at a little less than 2%, but the management team have been quite constant in their dividend raises. I am confident they will keep doing so in the future. So, I have recently added 10 shares of CNR at 66.98% for a total of 669.80$ . This adds 11.50$ in dividend to my passive income. I now hold 70 shares of Canadian National Railway and I'd like to hold a 100 shares. So this stock remains on my target list. Unfortunately, I wasn't able to buy some more because that's all the money I had in this particular account. Hence the small buy. I also bought some Bank of Nova Scotia. (again) How much of something good can you have? I guess a lot. I bought 19 shares at 53.55$ for a total of 1017.45$ This adds 43.20$ in dividend to my passive income. I now hold 170 shares of BNS and it's now my biggest financial holding with a weight of almost 6% in my entire portfolio. Finally, I bought shares of Alimentation Couche-Tard (ATD.B) twice. I bought 40 shares at a price average-cost of 56.83$ This adds 10.80$ in dividend to my passive income. I know this stock is not a dividend growth stock like most ones I hold and it's not very popular among the DGI community either. My take on this one is simple : would you rather get on the wagon now, while the dividend is low and the stock price affordable, or when the dividend is fat but the stock price is way too high? I have big hopes in this winner. I have my eyes on buying yet again either some more Power Corporation or Power Financial (POW and PWF). If one of them goes below more that 5% of my cost-average price of respectively 26$ and 30$ I will move. I will say it once again : these stocks are super cheap. CNR is still on my radar. If it goes below 70$ I will be extremely tempted. I am thinking about selling my TransCanada Corp (TRP) shares to buy some more Endbridge (ENB). Same with my Jean-Coutu shares (PJC.A). Will see how it goes. I would like to own no more than 20 stocks. What do you think about my buys and my immediate plans? I would like to hear about you guys.